H-Pylori is a stomach bacteria, is widespread, and implicated in a variety gastric problems, including stomach cancer. We recommend getting rid of it. The normal approach is to wait for a problem. H-pylori is short for Helicobacter Pylori. Creatures large and small tend to be referred to with just the first letter for the genus, and the species spelled out. With this scheme, most of us would be H-sapiens. The genus for this post’s featured pest, Helicobacter, derives from its corkscrew-like shape. It uses this shape to burrow into your stomach lining. This makes it hard to dislodge, but it is important to do so. H-pylori is found in the stomach of most Asians and Middle Easterners. In the west, about 40% of the population have it. For about 80% of the cases, there are no symptoms, so “standard-medicine” doesn’t normally test for it and treat it. However, 20% of the time it causes problems, and those problems can be considerably more serious than gastritis (stomach pain). We question this “80% have no symptoms.” Gastritis caused by H-pylori could well manifest itself as a dull but uncomfortable stomach pain. Such a pain would likely not be enough to send someone to the doctor, especially if it were intermittent. However, it is just such chronic inflammations that cause ulcers and initiate tumors. Ironically, heartburn (excess stomach acid) is not typically a symptom. H-pylori is able to neutralize stomach acid. It’s not doing this for your benefit though. The highly acidic stomach environment is, among other thing, a defense against bacteria, and will kill most of them. 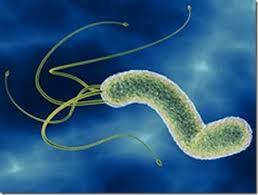 H-pylori manages to get the stomach cell to reduce the acid level, thus enhancing its own survival. The symptoms that typically trigger a test for H-pylori are stomach ulcers. The treatment is a course of antibiotics. It may take several courses, but ulcers are not the worst. H-pylori also causes stomach cancer. Stomach cancer used to be common in America 100 years ago. 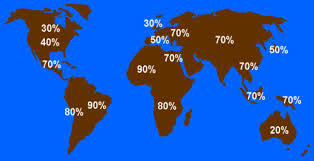 Improved sanitation has greatly reduced this. Stomach cancer is still common in developing parts of Asia. Once, just to see if you have it. After you have visited the Middle East or Asia. If you are experiencing stomach pain of any sort. It doesn’t seem wise to us to delay this test until there are symptoms reported. The test is not an expensive one. Perhaps the logic is that since 80% that carry H-pylori have no symptoms, why attempt to treat it. Expense should not be an issue really, the test is not expensive. Labs seem to have a cost of around $30. If it isn’t expense, reluctance to treat could perhaps be concern about antibiotic resistant strains. This is always a concern, but then, if you know you have such an infection, and there is a 25% or so risk that something serious will develop, it would seem that a course of antibiotics would be appropriate.